A man stands in a fortress or castle contemplating a crossroads or two different courses of action. This card often signifies a choice, especially a choice revolving around the issue of outer and inner reality, freedom and confinement or security and adventure. The figure in the image holds the world in his hands, as he stands literally in a palace or fortress, overlooking magnificent scenery and landscape. On the one hand this symbolizes the personal power we each hold to create the physical manifestation of our inner desires. All we need is a wand, that is, faith in ourselves and the enthusiastic bravery to act on behalf of our desires. Yet another meaning is suggested by the two of Wands, for even in spite of this man’s obvious material abundance, influential status and unlimited freedom, still he looks rather wistfully toward the horizon. He doesn’t seem at all content or even interested in the magnificent building that he has probably worked zealously and tirelessly to erect for himself. At one time this castle that he is standing in was the goal which he longed to attain, yet now he turns his back on that old wand, and reaches toward the new one. This suggests the tirelessness and basic love of expansion that pervades the entire Wands suit, which is not so much striving for finite accomplishment as it is for meaningful, joyous adventure along the way, and certain kinds of energizing challenges and quests for self-overcoming. Wands is a dynamic suit; when Wands suit predominate in a reading, then the most pleasure will be found in the conflict itself, or in courageously projecting yourself forward in defiance of every and any obstacle, rather than in the concrete completion or security of a certain aim. The Two of Wands captures the seeming paradox in temperament of one who loves to crusade on behalf of a cause but is actually somewhat saddened when he achieves the victory and has nothing left to fight for. In a reading this may suggest complacency or boredom with current conditions, inability to make a decision, or shying away from a call to a new project or venture. It may also indicate abandoning a project before completing it, either because your interest waned once the initial exciting stages were over, or because you became distracted by something new and fascinating. The Two of Wands card is connected to Mars in Libra, as a symbol of acquiescence without inner conviction or without practical consequences. The Two of Wands card can indicate that you have the power to manifest things in your life using the will and strength of your mind. You may soon go on a journey to find your place in the world and find the things you truly desire in your life. You may need to use your mind to make sound decisions during this time and weigh your options carefully to choose your best path. 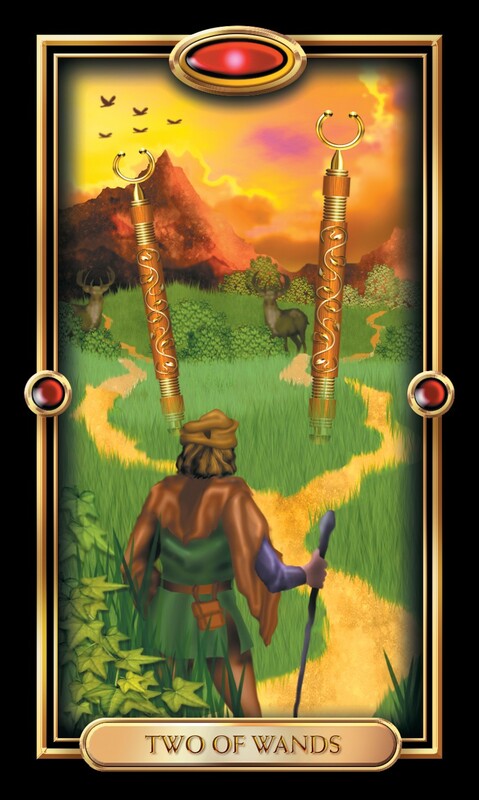 When the Two of Wands card is reversed, it may mean that you are experiencing difficulty in making a decision, which is possibly due to the fear of making the wrong choice. You may have weak willpower and be more comfortable following rather than leading. The Two of Wands card can signify a more balanced and smooth work life ahead for you as you figure out how to fit things together in new or unusual ways. If you are looking for new work, you may need a reminder that you are more put together and balanced than you realize. Beware of others who may try to knock you off your stride. The Two of Wands card can represent balance and equality in your love life, and things in your relationship may soon become more equal. You may need to pay attention to your ideas about balance, and share them openly with your partner. If you are looking for love, there may already be someone wonderful for you in your life already. If you give that person a chance, it may be everything you’ve been looking for in a relationship. The Two of Wands may mean that your finances will soon reach a point of good balance. You may need to ask for the things you are truly due or worth, and will likely be pleasantly surprised by how fast this improve your financial situation. The Two of Wands card may mean that you will benefit from a spiritual relationship with just one other person, and remember that you are an important part of your spirituality so you may be that one person for the moment. It may be a good time to take some needed time and space to care for yourself emotionally and spiritually to heal and prepare yourself for connecting better with others.